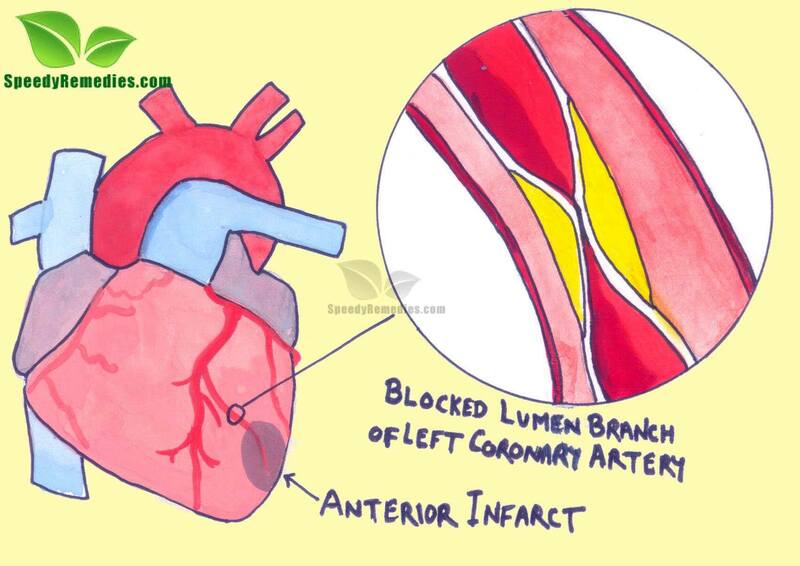 Coronary Heart Disease is also known as Coronary Artery Disease. Following hints from the name itself one can very well guess the nature of this disease which is related to the heart and coronary arteries that supply oxygen-rich blood to the heart. In this disease, the coronary arteries become clogged hence hampering the blood supply up to the heart and thereby denying the heart its fair share of oxygen ant other vital nutrients. This clogging or blockage in the arteries is caused by accumulation of fatty deposits on the inside lining of the arteries. When the heart remains bereft of blood supply for longer periods of time, heart attacks could also occur. Adopting natural home remedies for Coronary Heart Disease and bringing positive changes in the diet and lifestyle should help in the prevention as well as treatment of this disease. High Cholesterol, High Blood Pressure, Obesity, cigarette smoking, tobacco abuse, Diabetes, chronic kidney disease, and a genetic predisposition increase the risks of developing Coronary Heart Disease. Age is another factor that can neither be ignored nor controlled. Unhealthy high fat diet and lack of regular exercise or physical activity lead to Obesity which is the root cause of cholesterol and blood pressure related diseases which in turn cause heart diseases. Emotional stress and an impatient and aggressive nature are also harmful in the long run and contribute in causing heart diseases. The most common complaint associated with heart disease is that of Angina. Angina is a chest pain characterized by chest discomfort, tightness, aching, heaviness, pressure, burning, numbness, fullness, or squeezing. These symptoms may also be felt in the left shoulder, back, arms, neck, or jaw. Other symptoms include palpitations, light headedness, dizziness, rapid (or irregular) heartbeats, fatigue, sweating, nausea and shortness of breath. Different people have different degrees of the symptoms. At times, the disease might be there but the symptoms might not be manifested. The most serious and troublesome symptom of this disease is heart attack. Taking one teaspoon of raw onion juice on an empty stomach daily in the morning is one of the simplest home remedies for Coronary Heart Disease. Extract alfalfa juice from alfalfa leaves and drink it two times on a daily basis. Carrot juice can also be mixed in it the original alfalfa juice tastes too strong. Alfalfa juice is known for its therapeutic heart friendly properties. Regular intake of Indian gooseberry prevents and cures heart diseases naturally and effectively. Drinking parsley tea for three or four times a day serves as an efficient home remedy in healing the heart pains caused by the disease. Grind pomegranate leaves in water, strain it and finally consume the filtrate. Regular use of this natural remedy gives encouraging results in the treatment of several heart diseases. Take one teaspoon of honey regularly. Or, mix two parts of fresh asparagus juice and one part of honey and take one teaspoon of this mixture three times in a day. Honey and asparagus are effective home remedies for Coronary Heart Disease and high cholesterol. Daily drinking a glass of beet juice helps reduce the risks of heart diseases. Safflower oil is a tried and tested natural home remdy for cholesterol and heart related diseases. Fresh apples and grapes make for excellent natural home remedies for Coronary Heart disease. Raw garlic is considered beneficial in preventing, controlling and treating a number of diseases including heart diseases. It would be wise to include garlic in the diet in some form or the other. Usage of olive oil in place of sunflower oil or groundnut oil is highly recommended. Care should be taken to use the oil in moderation. Fresh green vegetables, especially the outer leaves of cabbage are rich sources of vitamin E improves oxygenation of the cells and thus aids in proper functioning of the heart. Vitamin C present in citrus fruits and Vitamin B complex found in whole grains are also essential parts of the perfect diet for a healthy heart. Non vegetarian foods, especially red meat, are best excluded from the diet. Sweets, syrups, cream, butter, canned and processed foods should also be avoided because they are high in calories and sodium which indirectly cause damage to the heart. Light exercises like swimming, slow cycling, walking and gardening are important aspects of a healthy lifestyle and help in reducing the stress levels as well. These measures help in controlling heart diseases and also the various causes of heart diseases like High cholesterol, High Blood Pressure, Diabetes and Obesity. So, going for a healthy and balanced diet provides a holistic approach towards the control of many diseases.